A staff member demonstrates a new face recognition system used for the Tokyo 2020 Olympic and Paralympic Games during a press conference in Tokyo Tuesday, Aug. 7, 2018. 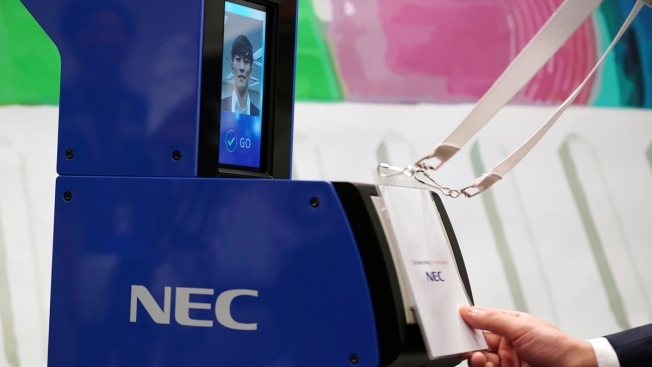 The NeoFace technology developed by NEC Corp. will be used across the Olympics for the first time as Tokyo organizers work to keep security tight and efficient at dozens of venues during the 2020 Games. The NeoFace technology developed by NEC Corp. will be customized to monitor every accredited person — including athletes, officials, staff and media — at more than 40 venues, games villages and media centers, Olympic and company officials said Tuesday. Local organizers said Tokyo will be the first Olympic host to introduce the face recognition technology at all venues. The system is expected to effectively eliminate entry with forged IDs, reduce congestion at accredited waiting lines and reduce athletes' stress under hot weather. Tsuyoshi Iwashita, Tokyo 2020 executive director of security, said venues that are spread within and outside of the capital would be a big burden in achieving high levels of security. "By introducing the face recognition system, we hope to achieve high levels of safety, efficiency and smooth operation at security check points before entry," he said, adding that the system would contribute to less stressful environment for athletes. Iwashita said a test last year showed gate checks using the facial recognition was more than twice the pace of the conventional system using X-ray with visual siting by security guards. The facial images of every accredited person for the Olympics and Paralympics will be collected after the approval process and stored in a database to be used to verify identities at accreditation check points.